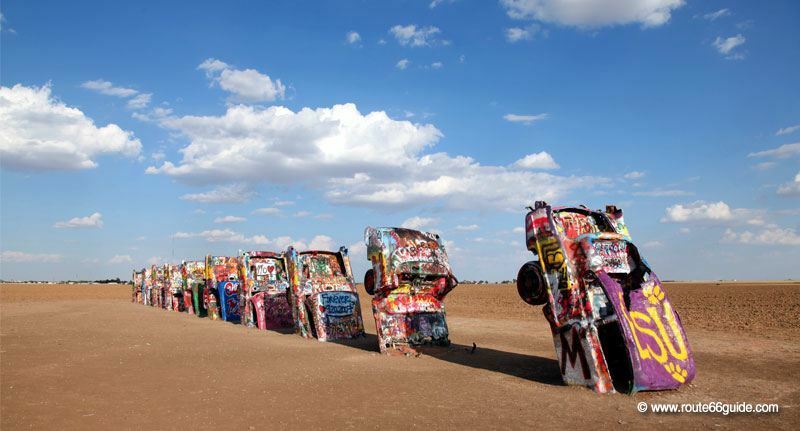 The landscapes on Route 66 are nearly as mythical as the road itself. Maybe even more. 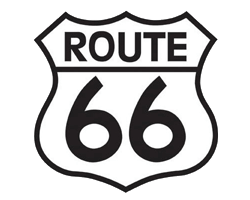 Now, have they shaped the legend of Route 66 or is it the other way around? 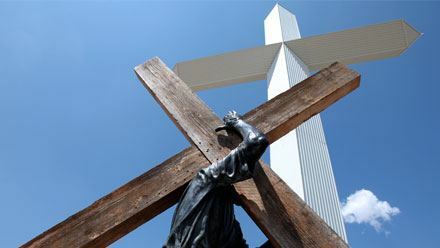 Really hard to say as the former transcontinental route winds through green pastures and forests of Illinois, Kansas and Missouri. Entering Oklahoma, the grass becomes less green, sparser, and the desert gradually takes its place. On seeing this, one can easily understand the havoc caused by tornadoes as they race unopposed at dizzying speeds over these vast, pristine prairies. 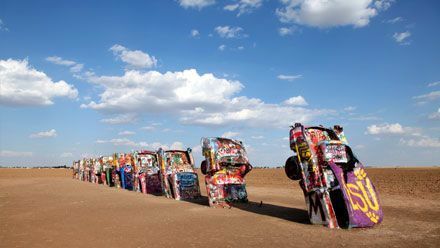 Above: Cadillac Ranch in Amarillo, Texas. North Texas, known as the "Panhandle", is devoted to cattle and oil. As we stop by in Adrian, we are just sitting halfway on Route 66, anticipating the dizzying heights and mythical deserts ahead of us between New Mexico and California. A few miles off the historic route, we discover the striking Grand Canyon near Flagstaff and Williams, Arizona, and Death Valley in the hollow of the Californian Mojave desert. Back on Route 66, we already start a slow descent, crisscrossing the hills to the polluted, smog-filled area of Los Angeles, onto the Santa Monica Pier, facing the Pacific Ocean. 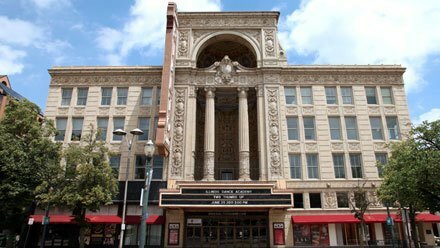 At the eastern end of Route 66, the bustling Chicago, avant-garde of the cultural scene, and the five Great Lakes region bordering Canada. 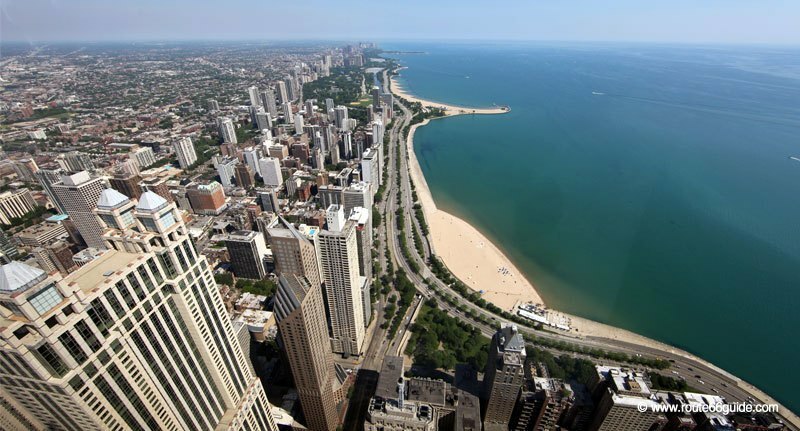 Adjacent to Chicago, Lake Michigan, is the largest lake on U.S. soil and the fifth largest in the world. On its banks, numerous parks and about thirty beaches whose sand, laden with quartz, crackles under our feet -thus its singing sand nickname. Above: Lake Michigan. Chicago, Illinois. 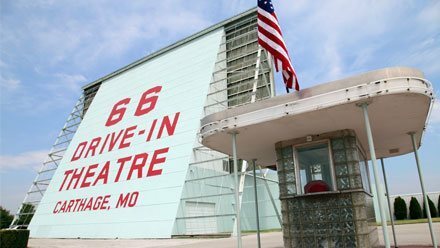 This 4.6-mile system of limestone caves along the Missouri Ozarks has always been one of the major attractions along Route 66. 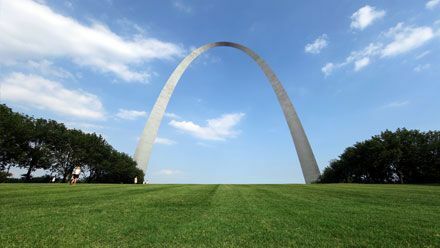 In fact, they lie tens of miles off the route, as inferred from the mass and innovative advertising its owner posted along Route 66. 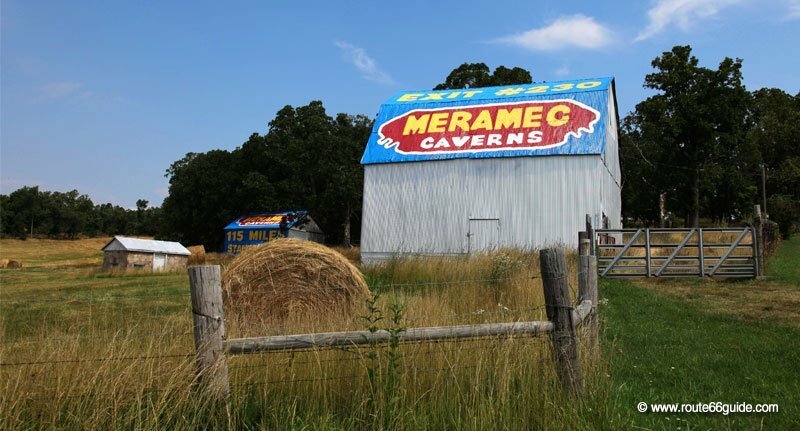 Meramec Caverns are indeed marked by a multitude of barns painted in bright colors, showing the distance remaining to reach them. Only a few of these "advertising Meramec Barns" are still standing. Above: Phillipsburg, Missouri. Barn with Meramec Caverns Advertising. Discovered in 1722 and extended in 1933, Meramec Caverns are known to have hidden the famous outlaw Jesse James and his accomplices in the 1870s. By far the most visited cave system in Missouri (which is nicknamed "The Cave State"), Meramec Caverns welcome over 150,000 visitors each year. 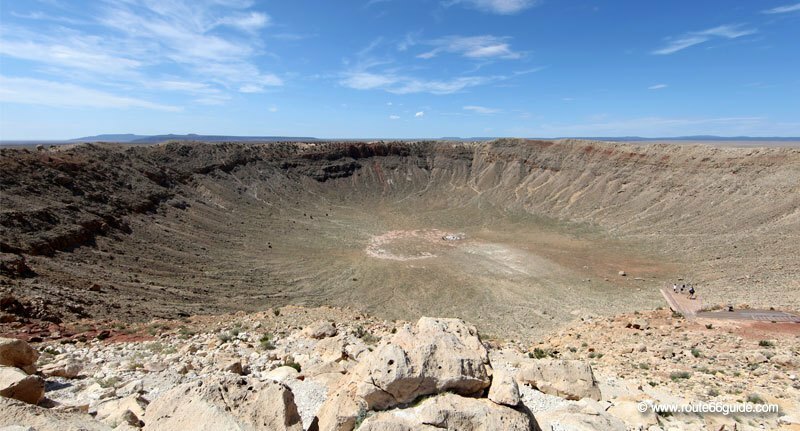 In Arizona, the "Meteor Crater" is a gigantic impact depression, 4000 ft. wide and 570 ft. deep, caused by a meteorite that hit the ground 40,000 years ago, decimating any plant or animal life within 90 miles. Above: Meteor Crater in Meteor City, Arizona. 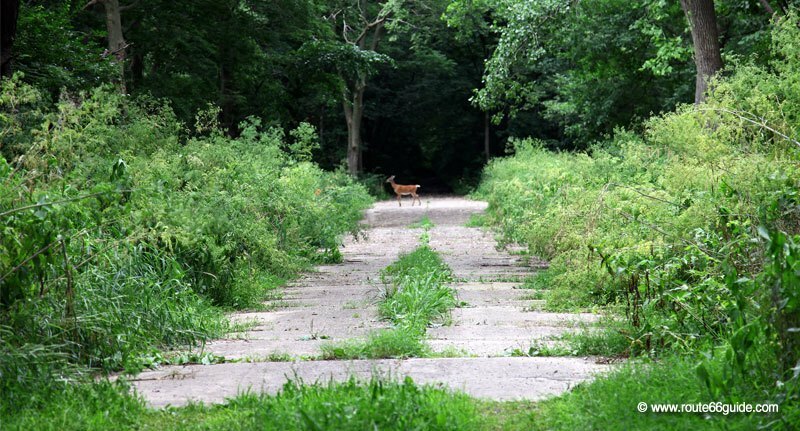 Paved trails and observation platforms allow you to imagine the violence of the shock. Be careful with smaller cliffs as they are not always secure. Carved by the Colorado River, the intimidating Grand Canyon is only a stone's throw from Route 66 and contributes to its popularity. Even if the historic route does not cross the national park itself, it offers splendid views on the delirious geological fault and meanders through Flagstaff and Williams, both along Route 66, the traditional gateways to Grand Canyon National Park. 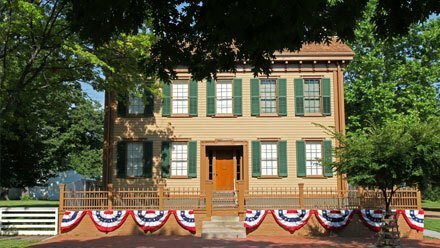 They offer numerous lodging options that can be easily oversold in the high season. It pays off to think ahead! Above: The Grand Canyon National Park, near Flagstaff and Williams, Arizona. In the distance, like a mirage flowing through red rocks, we guess the deep blue Colorado River. If the Grand Canyon annually attracts over 4 million visitors, it is primarily for the incredible sensation of dizziness and freedom felt as your feet slowly inch towards the edge to intake whole the amazing spectacle: the rift snaking through rock walls illuminated in a thousand hues, exacerbated early morning or late afternoon when the sun flares up the rock. After seeing it in pictures, TV series or movies, it was amazing to finally grasp the stunning excess of the natural fault, 227 miles long and up 6,000 ft. deep. 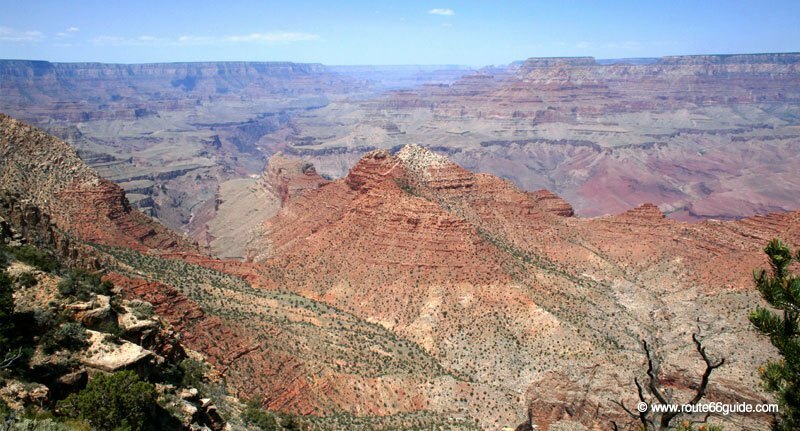 Included in UNESCO’s World Heritage, the Grand Canyon is protected by the U.S. National Park Service since 1919. We left the sandy beaches of the north-east of the country, on the shores of Lake Michigan, to find them again in California, 2,500 miles away. The Santa Monica Pier symbolically marks the end of the historic route. Today, while entirely pedestrian, it holds a small monument on the dock to commemorate the official end of Route 66, a not-to-be-missed photo opportunity. Set in a chick suburban area of Los Angeles, the Santa Monica Pier features shops, restaurants and bars along the long pier that extends over the water. Above: Santa Monica beach. Los Angeles, California. 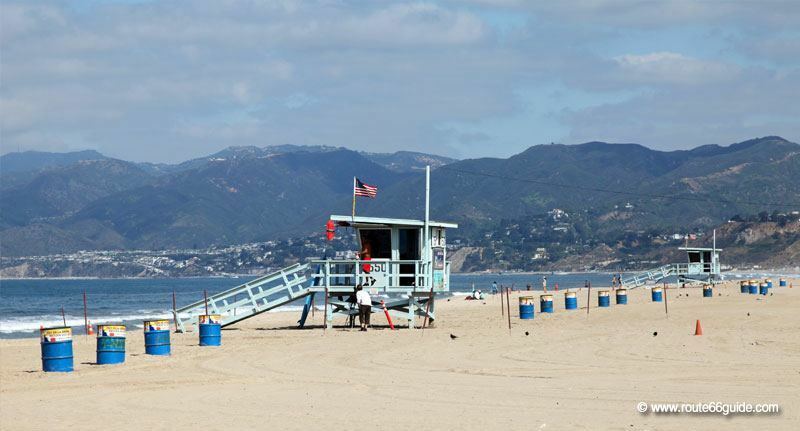 In addition, the lifeguard towers are planted in the sand, while seagulls and tramps seek the refreshing shadows among the wooden pillars supporting the dock. Not far away, the most prestigious hotels in the City of Angels compete for the prestigious pier.